Proactive self-help will save money and improve health, says Bio-Logic Aqua Research founder. With the national debate over the Affordable Health Care Act (Obama Care) and the rising cost of medical services, health advocate Sharon Kleyne is concerned that too many people rely solely on their doctors to make health choices for them. Mrs. Kleyne also advocates freedom of choice for self-education. "There's a wealth of information on lifestyle, diet and health on my company's website (http://www.biologicaqua.com)," she states. "There are also numerous excellent medical websites, alternative medicine websites and diet and exercise websites, plus many fantastic books. In the Information Age, educating yourself has never been easier." 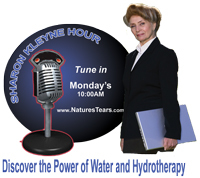 The website for the Sharon Kleyne Hour Power of Water radio show (http://www.SharonKleyneHour.com) contains archived on-demand replays and printable summaries of Sharon Kleyne's interviews with hundreds of leading health care authorities. She syndicated show is broadcast live Mondays at 10 a.m., PST/PDT, on Voice America/World Talk Radio, Green Talk Network and Apple iTunes. Also visit http://www.naturestears.com, http://whatistheeye.wordpress.com, "Nature's Tears EyeMist" on Facebook and "Bio-Logic Aqua" on Twitter. The Sharon Kleyne Hour Power of Water, is sponsored by Bio-Logic Aqua Research, whose Nature's Tears® EyeMist® is the only all-natural, all water patented humidifying device that soothes dry eye symptoms and supplements natural tear film water. Nature's Tears® EyeMist® is available at http://www.BioLogicAqua.com, Amazon.com, drugstore.com and selected drugstores nationwide.